Weirdly Funny and Intelligent Country Music from Left of Centre. Sometimes albums can grip me straight from the first track and sometimes it takes several listens in various circumstances before it all clicks together. Both statements are true for this record. I’d spent the previous couple of days listening to several ‘singer-songwriters by numbers’ and was certainly suffering from lap-steel fatigue, when the Byrdsian intro to Welcome to The Show drifted out of my speakers. This minor delight was followed by a voice not unlike Gram Parsons being channelled through Roger McGuinn and I was instantly entranced. In some ways that is the template for what follows; but not slavishly so as several songs are pretty ‘out there’ in a way normally associated with Eels, They Might Be Giants or even The Handsome Family on a particularly sunny day. Look of Approval is a great example; if I told you it had a mystical Indian beat to it and multi-layered harmonies singing a soft easy-listening love song you’d probably be put off. But don’t be; it’s quite inspired and beautiful in its own way. The Toronto based singer really throws caution to the wind on two back to back songs in the middle of the album. Drunken Yoga and Go Naked! are both great fun; but when you peel back the layers they are great songs about growing old and noticing it; then fighting it. As you’d expect not everything ‘works’ but what I’m not keen on will, no doubt have people feinting with excitement somewhere in the world. With that in mind my favourite song on Celia’s fourth solo album is kept till the end (if you don’t count the German version of Welcome to The Show). Perhaps it was how I was feeling the first time I heard it; but I still feel the same way now two weeks later, but Smile You’re Alive is absolutely wonderful. Sounding a bit like Harry Nilsson singing a Tom Paxton Celia left me hanging by a thread and desperate for a follow up in exactly that same vein. What more can you ask for? 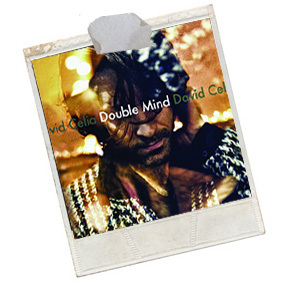 Double Mind isn’t for everyone; but yet again I’ve found another diamond of a singer-songwriter and feel the need to scream his name from the rooftops……DAVID CELIA!! !